The Canvas round Dixon umbrella will provide ample shade over a small table setting for four or more people. Simple and clean with a hardwood pole and Sunbrella® Canvas colored canopy; at home or ideal for cafes, spa’s and restaurants. It comes with a simple open and close pulley system. The umbrella base shown is not included in the price. 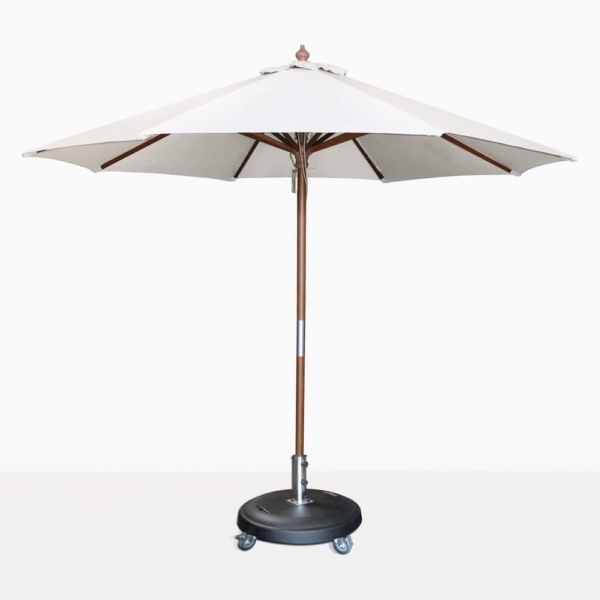 Teak Warehouse has stands available for these umbrellas. Please call and discuss with our knowledgeable staff re-pricing for our stands. The Dixon Sunbrella Round is also available in Taupe, Graphite, and Black colors. Sizes available are 7.5 as shown, 9.0, 10.0, and 11.5.